Nov. 10, 2018: Thanksgiving is a time when we get together and share a wonderful meal with family and friends. Now is a great time to start planning. You can make your meal extra special with something delicious from Nutmeg or Ladle of Love. 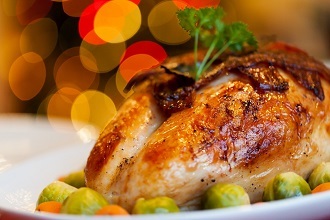 Or you can enjoy a delicious Thanksgiving meal at Underhills Crossing. Below are some ideas to help get your Thanksgiving planning started. Nutmeg, readily convenient on Main Street in Tuckahoe, has been serving delicious scones, muffins, tea and short breads, pies, cakes, cookies and a host of savory items for the past two years. Cindy Bothwell and her partner, Noel Dent, started selling their goodies at the Bronxville Farmer's Market six years ago from May to November under the name of "What's For Dessert." They changed the name to "Nutmeg" because they carry other items than dessert. Come into their cheery store, grab a goodie and enjoy a cup of really good coffee or tea. For Thanksgiving, they will be offering Special Orders on their famous pies. 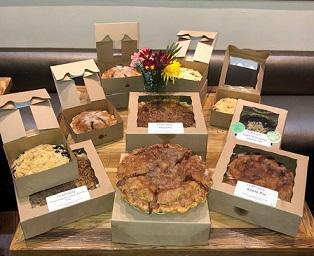 You can choose from Apple, Apple Crumb, Pumpkin, Chocolate Bourbon Pecan, a Fall Pie (with apples, pears, dried cranberries and cherries), Key Lime, Chocolate Ganache with Salted Oat (GF & V) and a gluten free Apple Pie. All the pies are 9" in size and will sell for $25. All these special pie orders must be received by the store no later than Sat. Nov. 17, and they can be picked up on Nov. 21st, the day before Thanksgiving. Another very popular item is their Shortbreads in the shape of small stars in delectable flavors: Cheese, Mexican Chocolate, Orange and Toasted Coconut, Cappuccino, Lemon, Rosemary and Olive Oil, Parmesan and Cracked Pepper, Nutmeg and Maple Bacon for $6.50 a box. These make a great gift, or you can serve them as an hors d'oeuvre before Thanksgiving dinner. Nutmeg provides their food items to local caterers and restaurants. The store is open Mon. 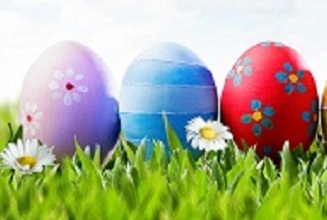 through Fri. from 7am to 7pm; Sat. from 9am to 5pm and Sun. from 9am to 3pm. In February of 2019, Ladle of Love will have been in the village of Bronxville for two years, dishing out the village's favorite soups, sandwiches, salads, wraps, hand crafted meals and rotating daily specials. -Best of Westchester soup, Harvest Celebration; a delightful concoction of creamy butternut squash, sweet potatoes, carrots, apples and maple syrup (gluten free and vegetarian). -Truffle Cauliflower soup made with shallots, vegetable stock, and a touch of cream and butter (gluten free and vegetarian). -Roasted Sliced Turkey Breast, (un)Creamed Autumn Greens, The Stuff(ing) of Life, Sauvignon Blanc Gravy, Cranberry-Orange Sauce made with orange juice and grand marnier (gluten free and vegan). In addition to the a la Carte menu, A Family Feast ($375, serves 6) includes a soup, main dish, and six sides. Pickup and delivery orders can be placed over the phone or via email (info@oflovegroup). 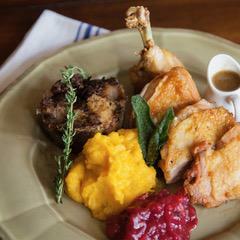 Their Thanksgiving offerings will also be available at Mrs. Green's Natural Markets in Scarsdale, Mt. Kisco, Briarcliff and Yorktown, along with many of their soups, year-round. At Ladle of Love, a Thanksgiving Panini will be featured daily through November. Holiday Gift Baskets can be delivered county wide, or beyond with overnight shipping if necessary. Ladle of Love has also announced a Meal Plan Program that is personalized for individuals or families, offering daily or weekly meals which can be customized to dietary preferences and needs. Whether dairy free, gluten free, vegetarian or vegan, these meals are fully prepared and cooked locally, and delivered right to your door. Ladle of Love is open 7 days a week: 10am to 8pm Mon. to Thurs. ; 10am to 7pm Fri.; 10am to 5pm on Sat. and 11am to 4pm on Sun. Underhills Crossing Restaurant celebrates Thanksgiving 2018 by bringing the very best farm-to-table offerings to you in our Culinary Team's prix-fixe, three-course menu. Choices range from traditional holiday fare, Underhills Crossing style, to the not-so-traditional Thanksgiving menu selections. Dinner will be served 12N-8pm Thanksgiving Day. Reservations a must. A young adults' menu for ages 12 and under will be offered for our younger guests. Underhills Crossing Restaurant will be giving thanks all holiday weekend with a weekend of music Thanksgiving Eve, Friday and Saturday. 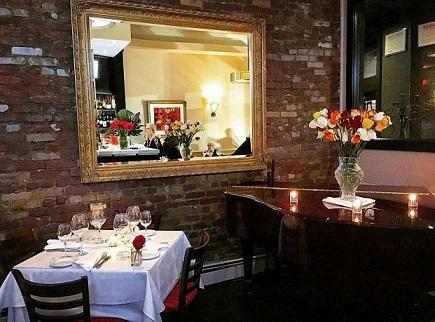 As a special treat, Rick McDonald, New York City's renowned speakeasy pianist, will be joining us on Saturday, November 24th for a special guest performance. Kick off the holiday shopping season with a pampering Black Friday brunch from 11:30-3pm the day after Thanksgiving before the busy pace of the season begins. A complimentary toast of warm apple cider or eggnog awaits this holiday season.....we look forward to toasting you!